A ghostly tale from days gone by. "My army basic training was in Malvern in Worcestershire and we were then sent to the nearby Blackdown transit camp. This was in total contrast to the immaculate camp we had left. Old Nissan huts stood between weed covered flagstones, and just behind the guardroom was a derelict mortuary in which could still be seen a stone autopsy slab. During the war Blackdown had been a hospital for shell-shocked American soldiers and it had a macabre history. And we soon heard the camp had a ghost named Lucy. Apparently she had been a nurse who was brutally murdered by a traumatised GI one night. 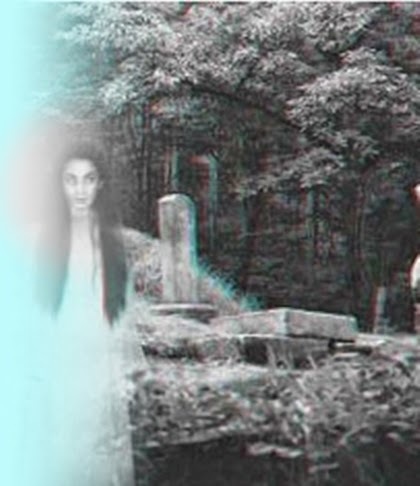 Over the years several men claimed to have seen her ghost after dark. Some said they were woken by the bedclothes being slowly pulled away and had the feeling of being stared at from above. I took the ghostly gossip with a pinch of salt - until I experienced something! It happened one moonlit night when three of us and the corporal were chatting about Lucy. I said it was a load of rubbish and the others agreed except the corporal, who dared us to walk through the mortuary. No problem. We made our way there and filed past the slab where dead bodies had lain. Suddenly we stopped short. We could hear a woman quietly singing. We made a mad dash for the exit and didn't stop until we reached the guardroom. After all these years I still wonder if it was Lucy." Eerie! And sort of comical, too, that it happens just as the guy says the story is rubbish! I also thought this was sort of comical and like the art work.